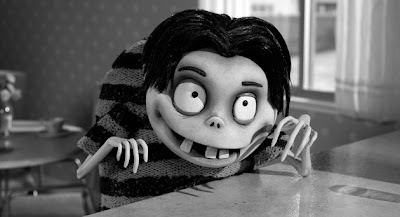 Here's the "early" trailer debut plus a new still for Tim Burton's FRANKENWEENIE. The black and white, stop motion 3D movie stars Winona Ryder, Martin Short, Catherine O'Hara, Martin Landau, Charlie Tahan, Atticus Shaffer, Robert Capron and Conchata Ferrell who all lend their voices for the film. Look for Frankenweenie in theaters on October 5th. After unexpectedly losing his beloved dog Sparky, young Victor harnesses the power ofscience to bring his best friend back to life - with just a few minor adjustments. He tries to hide his home-sewn creation, but when Sparky gets out, Victor's fellow students, teachers and the entire town all learn that getting a new "leash on life" can be monstrous.